In late August, The Sunlight Foundation released Ad Hawk (iOS and Android), and Glassy Media released SuperPACApp (iOS). 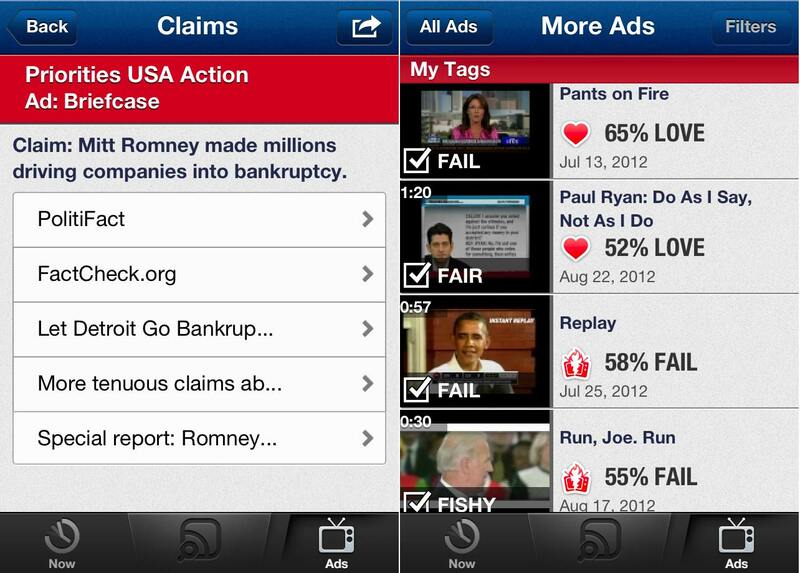 Both apps help voters identify an ad sponsor -- SuperPAC or official campaign -- in real time. A month ago, before the Republican and Democratic national conventions, the average TV viewer in Cleveland was seeing about 87 presidential campaign ads each week. And in Orlando, Fla.? About 70. According to Joseph Mercurio, who manages political ad buys, those numbers are “unprecedented.” He told the AP that a competitive statewide race with “heavy” expenditures would have only about 20 ads being viewed each week on average. Most of those ads, from both sides, are negative attacks on the other guy. Almost all include statistics that may or may not be true. Often a soundbite or voting record has been taken out of context. Given the barrage of messages and no “truth in advertising“ requirement, how is a voter to separate fact from fiction? The problem is especially acute if she lives in a swing state, which is where the bulk of advertising dollars lands. There’s an app for that. Actually, there are apps for that. In late August, the Sunlight Foundation released Ad Hawk (iOS and Android), and Glassy Media released SuperPACApp (iOS). 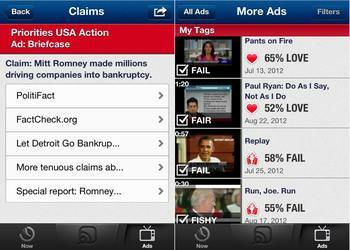 Both apps help voters identify an ad sponsor — SuperPAC or official campaign — in real time. Both apps use digital music fingerprint technology to identify an ad that is playing on your TV or computer. When an ad is playing, a voter can pull out her phone, tap an icon, and learn who paid for the ad — well, if the phone is connected to the Internet. That’s because each app transmits a sound sample back home; the sample is then compared to a database of previously identified audio — just like SoundHound or Shazam, two popular smartphone apps for identifying music. Both apps tell you the name of the ad sponsor, but the similarity ends here. 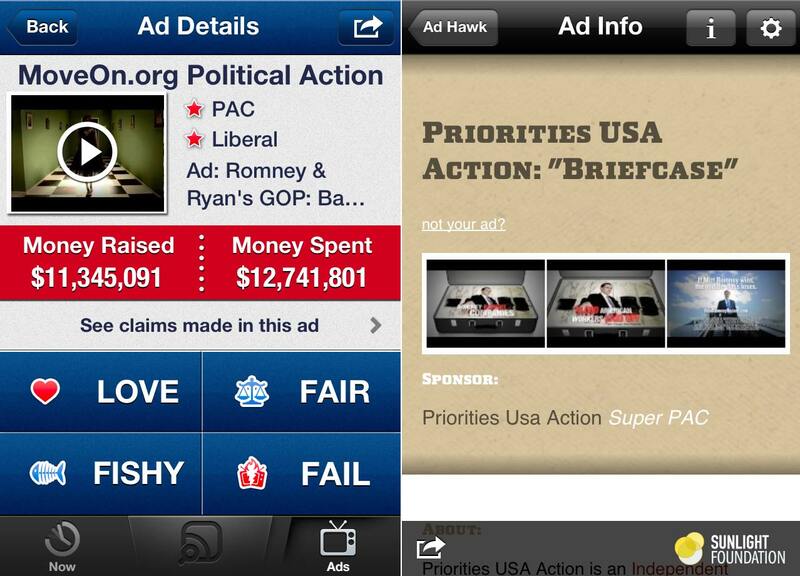 The SuperPACApp focuses on ads; Ad Hawk focuses on organizations. Ad Hawk’s supplemental information consists of a short descriptive profile and links to the Sunlight Foundation website, if the ad is from an official campaign. If the ad is produced by a SuperPAC, then Ad Hawk adds expenditure data, noting whether the organization supports or opposes Democrats or Republicans. One of the links is to Influence Explorer, a project of the Sunlight Foundation and OpenSecrets, among others. 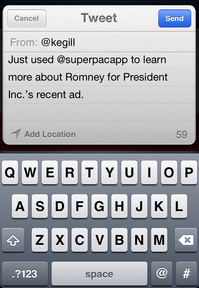 The SuperPACApp treats official ads like SuperPAC ads and has greater depth. Not only does it provide more information about each ad than Ad Hawk, the SuperPACApp has an ad archive. This means you can check out an ad that is not currently playing. I tested several ads on my iPhone 4 using YouTube as my “television.” In each case, the SuperPACApp identified the ad much faster than Ad Hawk. The SuperPACApp FAQ says it may need 12 seconds to identify an ad; Ad Hawk may need 30 seconds. With most TV ads being 30 seconds or less in length, the interested voter will need to keep her smartphone on and open to the app to successfully check out an ad in real time. The Sunlight Foundation database for Ad Hawk is not as extensive as that supporting the SuperPACApp. On several occasions, Ad Hawk failed to make a match; it also crashed frequently. In January the FEC thought ad spending for the 2012 campaign cycle could top $11 billion. It was numbers like these that inspired Jennifer Hollett to join forces with Dan Siegel to create the SuperPACApp. Their idea began as a project in an MIT Media Lab social television class. 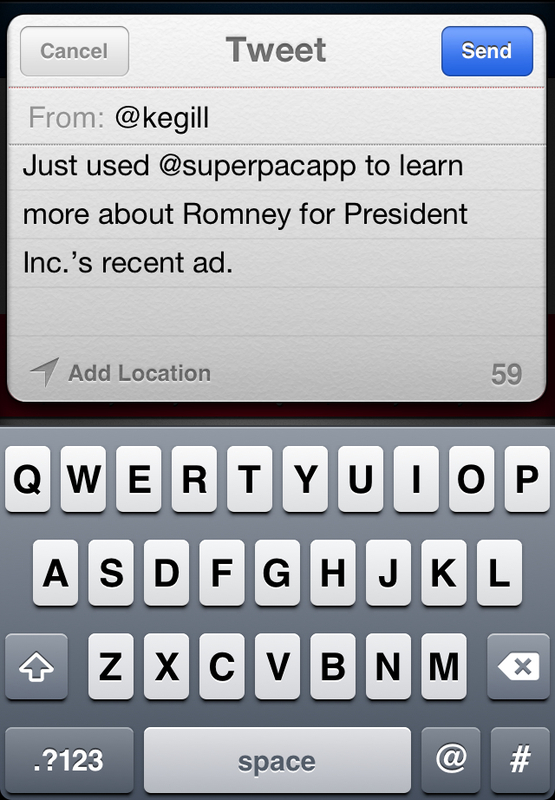 In the basic ad view for SuperPacApp, it highlights the producer (is it the campaign, the committee or a superPAC?) and signifies their influence based on dollars raised and spent. If you aren’t familiar with an organization, don’t worry: The app reveals its political orientation. These data come from the OpenSecrets database, a project of the Center for Responsive Politics. Key for the fact-checking voter, the SuperPACApp summarizes the claims made in each ad (some ads have more than one) and provides links to resources like PolitiFact and FactCheck. The app incorporates standard iOS functionality; you can easily open one of these links in Safari or in the app. The SuperPACApp team doesn’t tell you if the ad is filled with truthiness; that insight is left to you and the community. Although ad-matching relies on a computer-based system that depends on well-written algorithms, the claim summary and supporting links are a human-based system, according to co-founder Hollett, a Canadian broadcast journalist. If you want to learn what other voters think about an ad, you have to cast a vote. Doing so will reveal how many voters (as a percentage) rate an ad in each of four categories: fail, fishy, fair and love. I like the three Fs because they sound like reasoned judgments. But love? Love is an emotion. It’s possible to “love” an ad that fails on truthfulness if the ad matches your worldview. However, it’s not possible for an individual to game the system. Any vote you cast acts like a bookmark and slots that ad into the MyAds view in the app with the vote highlighted. Votes cannot be changed — one vote per phone. Findability: At launch, the SuperPACApp had more than 320 ads in its database, Hollett said. The team added at least 100 ads in the week following launch; a handful are from viewer tips. The app facilitates browsing by organization name, and ads appear in reverse chronological order. An option for alphabetical by title would be helpful. So would a granular search; currently there is only a high-level filter. A list of all the SuperPACs in the database would also be useful. 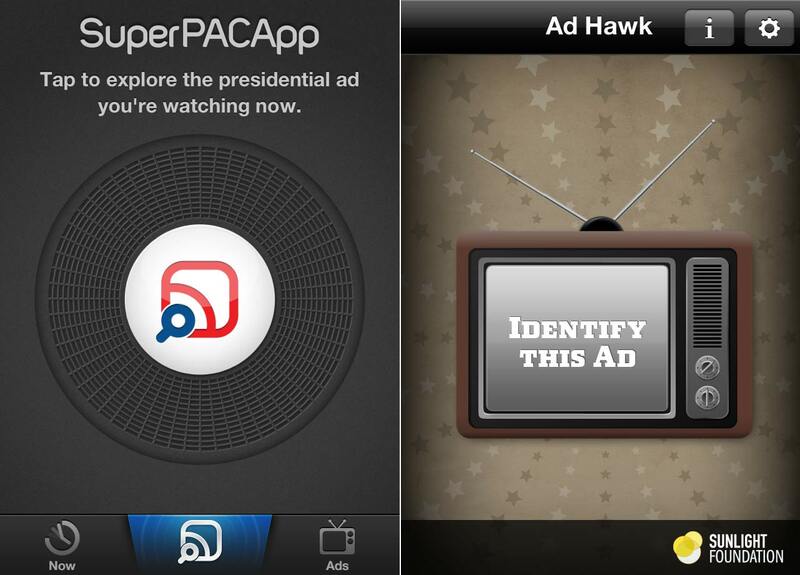 Provenance: The Ad Hawk app provides more information about each SuperPAC than the SuperPACApp. Add a screen that contains both background on the SuperPAC as well as links to the organization website and the OpenSecrets or Influence Explorer organization profile page. Sharing: Although there is a “share” option, it’s a misnomer. Rather than share information about the ad you just watched, you can tweet, email, Facebook or text a promotion for the app. Being able to share information about a specific ad would help this app truly go viral. But that functionality depends on my last wish list item. Undo: There is currently no way to change your assessment of an ad. If you bump the wrong button, too bad. Web interface: It feels slightly foreign to be asking for the information in a mobile app to be accessible via a standard web browser; the request is usually in the other direction. But in this case, the information presented is so important that it’s a shame only iPhone owners using iOS 5+ can see the analysis or the archived ads. The SuperPACApp provides no information about the community. A superficial analysis suggests that the voter base is liberal in political orientation, based on the number of President Barack Obama-supportive ads with “love” ratings and Mitt Romney-supportive ads with “fail” ratings. A less charitable interpretation might be that Romney’s ads are less truthful. Hollett and Siegel — Glassy Media — are currently working out of the MIT Beehive Cooperative startup accelerator. The app has received funding from the John S. and James L. Knight Foundation. According to Hollett, the SuperPACApp debuted as the No. 1 free news app in the Apple App Store, and has “cracked the Top 100 Free Apps.” The two are working on the next version of the app; they will announce it at superpacapp.org as well as their social channels, @superpacapp and Facebook. I asked Hollett what advice she might have for entrepreneurially minded students. “Work hard, think strategically, and stay focused. Execution is key for any business idea, and life in general,” she said. Sounds like good advice for all of us. > The Washington Post is tracking ad spending in the presidential race and has an interactive map of the country which highlights the swing states. It also lists ads by message and has made a judgment on number and dollar amount devoted to negative ads. > The Sunlight Foundation Political Sleuth is a crowdsourced initiative for tracking television ad purchases. > The Television Bureau of Advertising (TVB) tracks industry news related to political advertising. > Ari Melber explains on MediaShift why fact-checking has gone viral this election season.